The Louderback Oyster Bateau is still on the Shaudys property between Central and Pacific streets in South Bend. Measurements for this craft were taken two years ago and marine archeologist Charles Moore has finished draft plans to federal historic documentation standards. After the plans are proofed they will be published and restoration can proceed. The ENA will eventually be documented the same way before restoration. 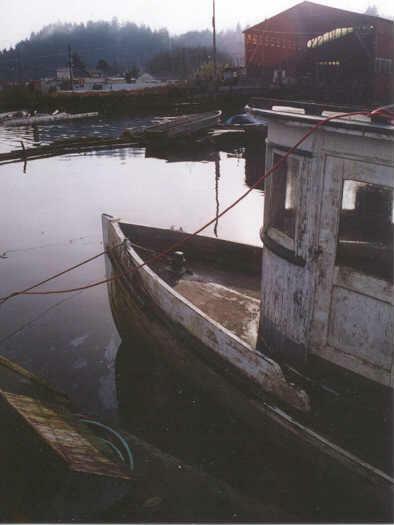 In order to formally organize these projects and raise money, I have incorporated the Willapa Maritime Museum with Washington's Secretary of State and opened a bank account in the organization's name with Harbor Community. We are working on IRS 501(c)3 status for the organization and hope to have a shelter for the ENA up on Eastpoint property before Fall. 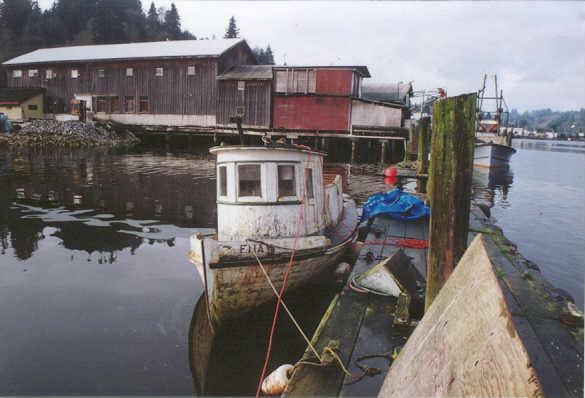 Incorporators for the Willapa Maritime Museum include Bruce Weilepp, Chair; Janet Furfiord, Director; Arnold Shotwell, Director; Leonard Bennett, Director; and Norris "Muggs" Petit, Director. We are acquiring the Louderback-built Launch named ENA. Here is a photo of the ENA prior to departure from the Louderback boatyard. Taken by Bruce Weilepp, November 20, 2001. Just 25 feet long, the Ena is a rare surviving example of a small "fan tail" launch from the early 20th Century. Although no early photos of the ENA have been found, the Louderbacks know that the boat's current cabin was built by tugboatman Dan Coulter during the 1930s. Photo by Bruce Weilepp, November 27, 2001. The bow of the ENA. Photo by Bruce Weilepp, November 27, 2001. The ENA was originally built for the Bush family of Bay Center. 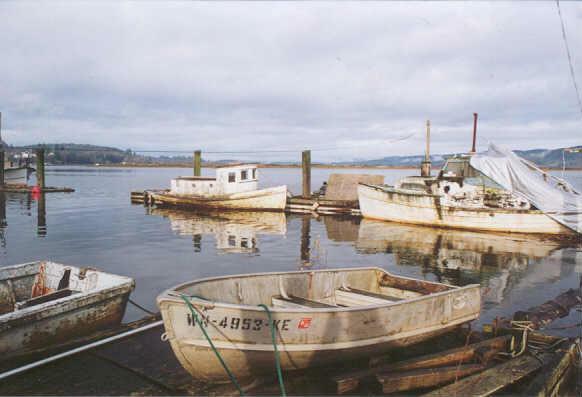 The Bush's were prominent in Native and Eastern oysters on Willapa Bay. Subsequent owners included Fred Badger, and Everett Kreitzer. Photo by Bruce Weilepp, November 27, 2001. 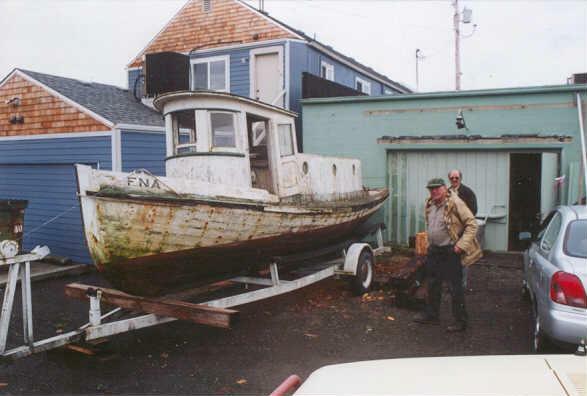 Moving the ENA to its new home was accomplished with the help of several volunteers, including Danny Louderback, Charles Summers, Leonard Bennett, and Mike Colyer. Photo by Bruce Weilepp, November 27, 2001. The ENA at the Museum (Vince Shaudys is in the foreground). Rescuing the ENA The Ena was kept behind The Pacific County Historical Society Museum building from November 2001 to November 2006. It was donated as a historic launch by the Louderback family of South Bend. The ENA was moved from it's berth at the Louderback boatshop to dry land behind the Pacific County Museum in South Bend, arriving November 27th, 2001. 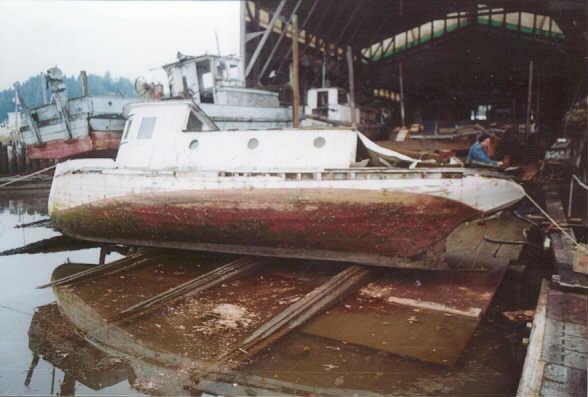 The ENA, whose name means "beaver" in the Chinook trade language, was built in 1904 by Dan Louderback, grandfather of Janet and Danny Louderback, current owners of the boatshop. Restoring the ENA was the dream of Janet and Danny's father, Marion Louderback. Marion was well known around the Pacific Northwest as a master boatbuilder, and preserver of an heirloom collection of historic boats. 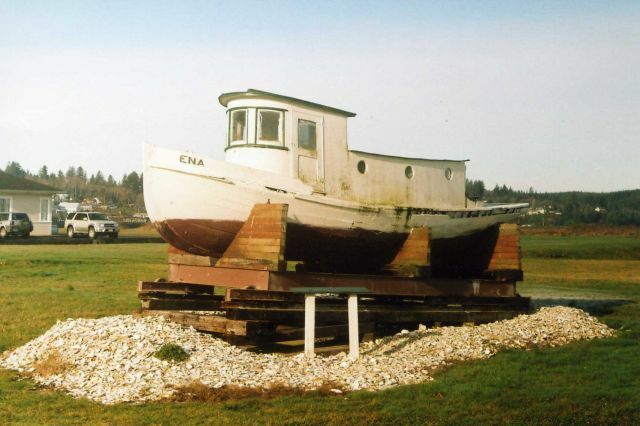 "It was Marion's dream to restore the ENA for use on the Willapa River", said Historical Society museum director Bruce Weilepp. "In the long run we hope to fulfill that dream. Our immediate concern, however, is to protect the ENA from further deterioration", said Weilepp. "We need to build a cradle for the hull to keep the boat's shape while it dries out, and construct a shed over it." 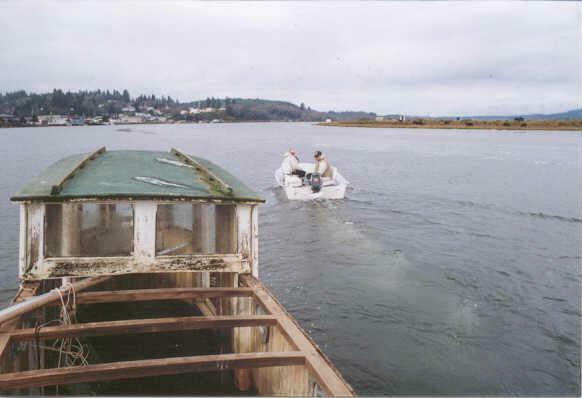 Purchase and preservation of the ENA and the Louderback oyster bateau, the last of its type floating on the Willapa, is being financed by donations. Contributions to help preserve the ENA are tax-deductible and should be directed to Bruce Weilepp at brucew@willapabay.org. 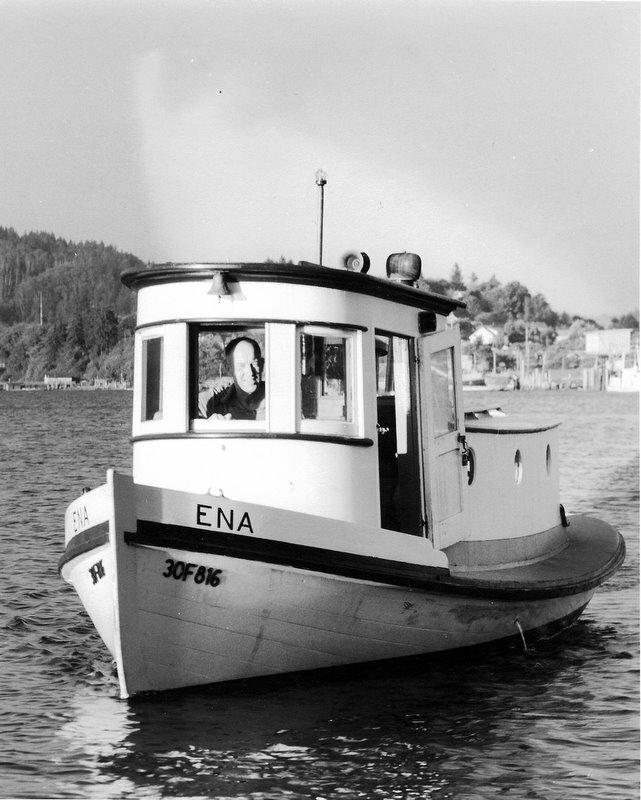 The ENA when she was still being used by Fred Badger as a pleasure boat in the 1960s. The Ena at her at her current location in front of Eastpoint Seafoods in South Bend. She is mounted on a marine railway in a cradle that helps support her weight and shape. Click for a larger image.